The Great 1815 Tambora Eruption: What if This Volcano Blew Today? Tambora was once a tall and graceful mountain, as high as Hawaii's great volcanoes, with a shape as classic as Fujiyama's. Then, in a series of great eruptions 200 years ago this week, it lost more than one-third of its height and covered a wide swath of today's Indonesia in choking, toxic ash. It was the most powerful eruption of the last 1000 years, as far as we can tell—our knowledge is far from complete. At the time, no one in the world was called a scientist. Electricity was a laboratory curiosity. The steam engine was bleeding-edge technology. Indonesia did not have a volcano agency, and it took months before ships brought word from the colonial Dutch East Indies to the rest of the world. The news that emerged was apocalyptic. The eruption's roar was heard a thousand miles away. The sun was entirely blotted out for days within about 400 miles of the volcano. Acid rain and layers of fine ash killed the crops, causing widespread famine and disease. Tens of thousands of people were sickened by caustic ash and sulfuric gases. Great sea waves had flooded harbors and coastlines across the East Indies. Fine ash particles and clouds of sulfuric acid droplets were injected nearly 30 miles up into the stratosphere and carried around the world. The summer of 1815 was marked by persistent red skies and cold days in Europe, North America and China. The weather was even worse in 1816, recorded by history as the year without a summer. Famine in Europe continued for several years more. The decade of the 1810s, as a result, is the coldest on record. 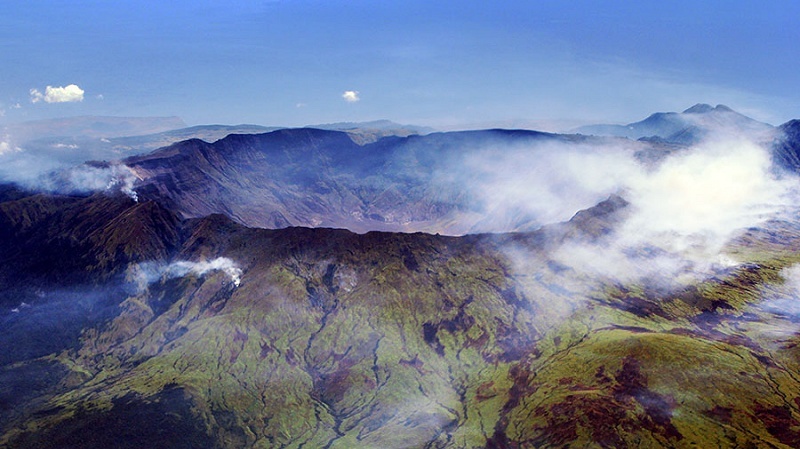 Volcanologists rank Tambora's eruption as a category 7 in their Volcanic Eruptivity Index scale. It's the only clear-cut example on the books—so far. Americans might picture this eruption happening in, say, the Pacific Northwest states among the Cascades volcanoes. Imagine the Mount St. Helens eruption of 1980, multiplied by 100 times. We have a fairly good idea of what happened, because it really did happen about 7700 years ago to a volcano in southern Oregon called Mount Mazama. The remains of that peak are now the center of Crater Lake National Park. Another Tambora will happen one day, as surely as Earth is an active planet. Eruptions that size are estimated to occur roughly every thousand years, on average. The next one could happen to some other lovely large volcano tomorrow. What will be different the next time? We'll have a better idea of the coming eruption in advance. The eruption of Bardarbunga last year, in Iceland, was a good example. In the weeks beforehand, scientists followed the magma as it moved underground and shared their data online. One by one, major volcanoes like Fujiyama are being studied with ambient seismic techniques. As volcano scientists learn more about their subject, our foresight will increase. We'll have a better idea of the eruption's effects. Ingenious experiments are helping us define fast ways to predict things like ashfall and plug the information into robust weather models. With sound methods in place, for instance, airlines can safely avoid engine-killing ash clouds. Word will get out fast. Today satellites, seismic networks and infrasound observatories will help us characterize the eruption within hours. Even before live video links are re-established from the scene, we'll have a good idea of what's happened. The world will help with rescue, relief and recovery. The United Nations, the Red Cross/Red Crescent, Direct Relief and many more agencies like them did not exist in 1815. Many thousands of people will die. The local inhabitants, whoever they are, will take the brunt of the disaster. Nearly all of the world's large volcanoes are in populated areas, and the world population has grown tenfold since 1815. No nation will ever be able to weather such an eruption with impunity. Total evacuation is impossible. Effects will be felt for years and around the world. Neighboring nations will suffer as displaced people pour over their borders. (Consider how Mexico City being wiped out by Popocatépetl would affect the U.S.) Climate disturbance will combine with economic disruption to cause misery and political instability of global extent. It will hurt all of us.